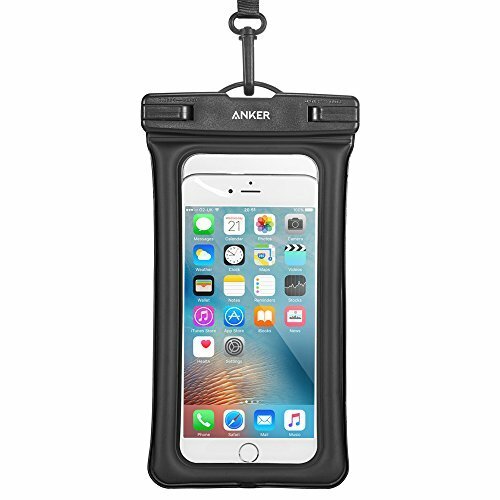 Home › Electronics › Anker Waterproof Case Ipx8-Rated Dry Bag Foriphone 6S / 6 / 6S Plus/ 6 Plus S..
Anker Waterproof Case Ipx8-Rated Dry Bag Foriphone 6S / 6 / 6S Plus/ 6 Plus S..
- IPX8 Waterproof: Keeps your phone (or other small gadgets) dry, as deep as 100 feet. Just slip your phone in and flip the clips for a water-tight seal. - Floating Design: Never worry about losing your phone to the bottom of the pool or ocean. Wear the included neck strap to avoid loss in insecure and uncontrolled situations. - What You Get: Anker Waterproof Case, neck strap, welcome guide, our worry-free 18-month warranty and friendly customer service. Anker Waterproof Case The Super-Sealed Waterproof Case for Phones From ANKER,the Choice of 20 Million+ Happy Users Industry-Leading Technology Worry-Free Warranty 99% Positive Amazon Feedback Certified Waterproof 100 FeetTake your phone into the pool, onto the beach, or beneath the waves without aworry. Filming Freedom Free yourself to capture great photos and videos of funin the pool or a diving adventure. Multi-Functional and Multi-ProtectiveEqually suitable for holding other small gadgets and personal effects. Itoffers protection against rain, snow, sand, mud, and more. Worry-Free WarrantyAt Anker, we believe in our products. That's why we back them all with an18-month warranty and provide friendly, easy-to-reach support. Note: Cases ofsome large phones may need to be removed to fit. Wear the neck strap ininsecure and uncontrolled situations, such as when out at sea, to avoid loss.